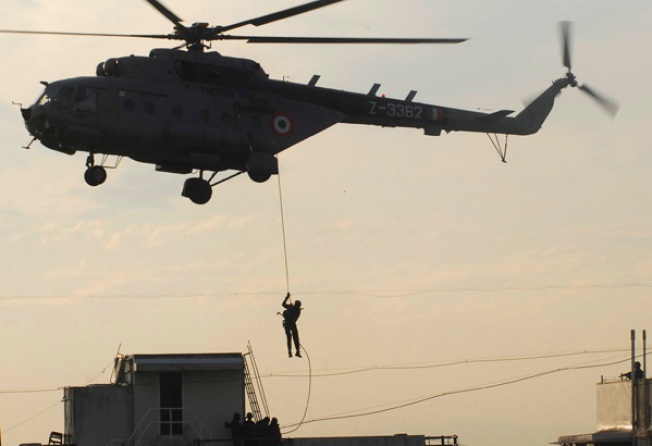 Indian commandos come down a rope to reach the top of Nariman House where the bodies of five hostages have been found in the Mumbai Jewish center according to an Israeli Foreign Ministry official. An Israeli-born New York couple who recognized the threat of terrorism in India but believed their mission of spreading Jewish pride was greater than the potential danger were slain in a series of attacks across Mumbai that have killed at least five Americans. Rabbi Gavriel Noach Holtzberg, 29, and his wife, Rivkah, 28, died in the attack on the ultra-Orthodox Chabad-Lubavitch movement's center in Mumbai, Rabbi Zalman Shmotkin said in New York. The Holtzbergs' toddler son, Moshe, was rescued by an employee and taken to his grandparents. 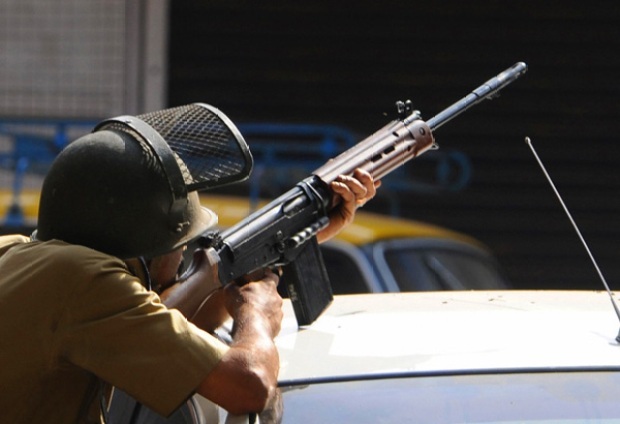 More than 150 people had been killed since gunmen attacked 10 sites across India's financial capital, Mumbai, also known as Bombay, starting Wednesday night, officials said. Also killed were a man and his teenage daughter from a Virginia community that promotes a form of meditation, a colleague said Friday. Alan Scherr, 58, and daughter Naomi, 13, died in a cafe Wednesday night, said Bobbie Garvey, a spokeswoman for the Synchronicity Foundation. The U.S. State Department confirmed their deaths. Mayor Michael Bloomberg said the deaths of the three victims from New York were "tragic losses" for the city. He said Teitelbaum, a Brooklyn native who moved to Jerusalem several years ago, was a kosher food supervisor. "Our hearts go out to these families and to the many New Yorkers of all different religions and ethnicities who have been affected by the attacks," he said. Members of the Chabad-Lubavitch movement gathered at the group's headquarters Friday to pray for the families of the dead. "Gabi and Rivky Holtzberg made the ultimate sacrifice," said Rabbi Moshe Kotlarsky, vice chairman of the educational arm of Chabad-Lubavitch. "As emissaries to Mumbai, Gabi and Rivky gave up the comforts of the West in order to spread Jewish pride in a corner of the world that was a frequent stop for throngs of Israeli tourists," he said. Shmotkin said at least three of the five victims at the center held U.S. citizenship: Teitlebaum was an American from Brooklyn, while the rabbi, who moved to the U.S. as a child, and Chroman both had dual Israeli-U.S. citizenship. Officials here were not sure whether Rivkah Holtzberg, also born in Israel, had dual citizenship. Twelve hours after gunmen stormed the center Wednesday, Sandra Samuel, a cook at the center, heard little Moshe's cries outside the room in which she had barricaded herself. She opened the door, grabbed the toddler and ran outside with another center worker. The little boy's pants were soaked with blood, and Samuel said she saw four people lying on the floor as she fled. Kotlarsky said Holtzberg's last known call was to the Israeli consulate. He said that "the situation is not good" before the phone went dead, according to Kotlarsky. The Holtzbergs arrived in Mumbai in 2003 to run a synagogue, provide religious instruction and help people dealing with drug addiction and poverty, Kotlarsky said. Hillary Lewin, a New Yorker met the Holtzbergs last summer at the center in India, said both the rabbi and his wife were aware of possible terrorism, but believed their mission was greater than the potential danger. Their attitude was "If I don't do it, who's going to do it?," Lewin said. Rabbi Yehuda Krinsky said Moshe will turn 2 on Saturday. "Today, he became an orphan," he said. A second son, who has been ailing, was with relatives in Israel when the attack happened. A third child died earlier this year of a genetic disease, the group said. The Scherrs were among 25 foundation participants in a spiritual program in Mumbai. Four others on the mission were injured in the cafe attack in the luxury Oberoi hotel, Garvey said, including two women from Tennessee. "I would call them bright stars," Garvey said of the Scherrs. "Extraordinary, bright, very positive — examples to the world." Scherr was a former college professor who lived at the Synchronicity sanctuary in central Virginia. His wife, Kia, and her two sons did not travel with them to India. According to the foundation's Web site, the community is led by Master Charles, a former leading disciple of Swami Paramahansa Muktananda. He is described as "one of the most popular spiritual teachers from India to build a following the West in the 1970s." He taught a form of yoga. Garvey identified the Synchronicity injured as Helen Connolly of Toronto, who was grazed by a bullet; Rudrani Devi and Linda Ragsdale, both of Nashville, who both underwent surgery for bullet wounds; and Michael Rudder of Montreal, who remains in intensive care after being shot three times. Other members of the mission narrowly escaped the attack.